Luckily, credit is a pretty big thing these days, and there are actually quite a number of ways to build it, even from scratch. One of the simplest ways to answer the “How can I build my credit from no credit?” question involves taking out a small loan for something, even if you can pay for it without the loan. The loan should be big enough that it will seem impressive, but small enough that you won’t actually have any trouble paying it back. If you go to the bank for a car loan with no credit at all, they’re likely to say you don’t have a credit history. If you’ve taken out a loan elsewhere, even if it was for, say, a third of the size of the loan you want for an automobile, the bank is likely to say that it is enough for them to give you a sub-prime loan for a car. It is important not to fall into the typical credit card traps, however, such as over spending. Not being able to see how much money you have to spend, or needing to write out a number every time you buy something can cause some people to loose sight of how much money they’re actually using. Some credit cards also charge per purchase, so if you’re only using your credit card to build credit, it might be best to only use the card for big things like the weekly grocery run, or filling up the tank, and cash for the smaller purchases, to minimize those hits. Asking, “How can I build my credit from no credit?” might be different if you’re in a smaller town. Some smaller businesses these days still use credit in the old sense of the word, meaning, “Put it on my tab, and I’ll pay it at the end of the week.” If you live in such a community, and operate through a local bank, you might have an effective enough credit rating already. If you can get these business owners to vouch for you, or if you have receipts proving that you’ve paid off a credit bill at a local establishment, this might be enough for a locally owned and operated bank to give you a sub prime loan. The great part about this is that once you have shown credit worthiness with the sub-prime loan, it will be enough to establish your credit for a larger or national bank in the future, so you’ll never need to ask “How can I build my credit from no credit?” ever again. 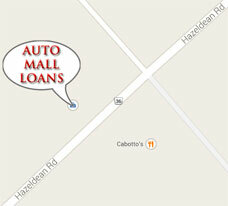 Give Auto Mall Loans a call to get help on building your credit from no credit.